Our pitches also have terraces, and are set in a pine forest, separated by different levels or by planted areas. Due to the way the campsite is arranged, all pitches enjoy a different 'campable' area. They can accommodate caravans, campervans and tents, and a maximum of 6 people. All of them have a 16 amp electricity supply. We recommend that you bring an extension lead of at least 30m with a socket that complies with European norms. 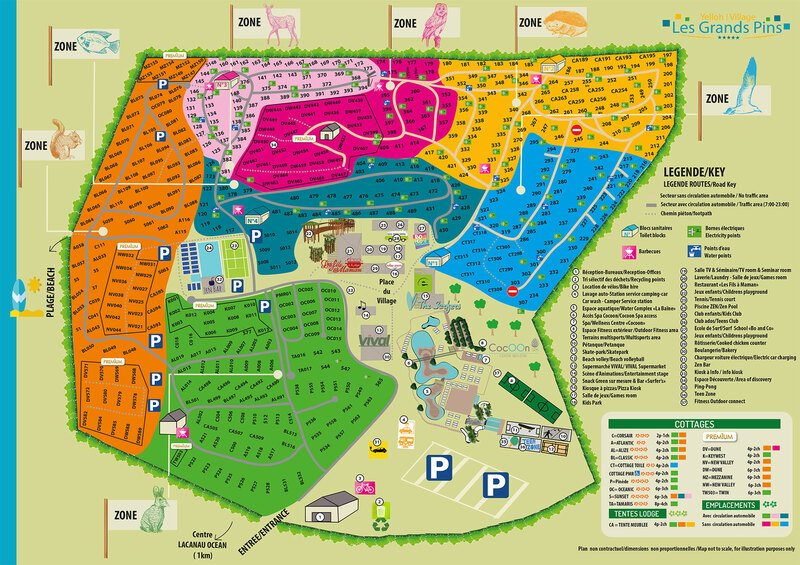 Nearby, you'll find drinking water outlets and barbecues in various areas of the campsite, as well as brand new toilet facilities. The traffic-free sector is for peace and tranquillity, in which your vehicle is parked in the parking area at the campsite entrance, and which is open 24 hours a day. Vehicles may only be driven when you arrive and when you leave. Entry to this sector is through a barrier which requires a code, which restricts traffic movement. Campervans may not be driven throughout your stay. In the sector in which traffic is permitted, vehicles may be driven between 7am and 11pm. Campervans may be driven throughout your stay. For optimal comfort, we recommend that you use the campsite car park to park your vehicle. All sorts of services to meet your requirements and go towards ensuring you enjoy a wonderful holiday at the Yelloh! Village Les Grands Pins in Lacanau! *Remember to book these services before you arrive to make sure you can enjoy them to the full!